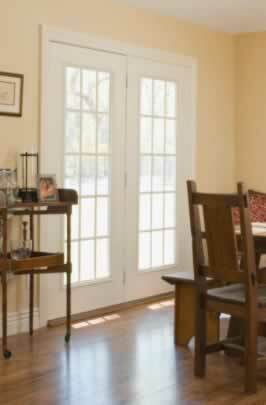 While perfectly functional, these French doors are truly works of art that light up your entire home. Fifteen panel, French doors like these provide energy-efficient, cost effective protection of your valuable investment. Neutral, bright colors blend comfortably with your interior paint and hardwood floors. They're a great way to cast your period furniture or antiques in just the right natural lighting. At the same time, today's historically accurate, modern French door sets come equipped with contemporary locks and hardware. You'll find a wide assortment of double-paned windows that keep your home warm in winter and comfortable in the summer. When energy costs keep rising, e-coated glass set in luxurious French doors combine economic sense with great style. Optional interior divided wood grills snap out easily for cleaning.